Car seat installation can be confusing. 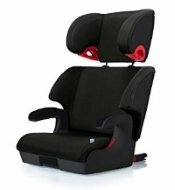 There are so many different car seats on the market, all with various installation methods. Over time, new safety features have made installation a feat in itself. Getting it right each and every time is difficult. But getting it right can be the difference between life and death. A quarter of all children who died in car crashes in 2015 were unrestrained. Up to 60% of all car seats are installed incorrectly. Those numbers show that parents still have room to improve when it comes to car seat safety. One of those challenges lies in the misuse or complete neglect of the top tethers in forward-facing car seats. In fact, in 2015-2016, Safe Kids found that 64% of parents with a child in a forward-facing car seat weren’t using the tether at all. Top tethers are part of the LATCH system (called ISOFIX in Europe & LUAS in Canada). In case you’re not familiar with it, here’s a rundown. What is LATCH and what are its components? LATCH stands for Lower Anchors and Tethers for Children. It was designed to secure a car seat with special straps on the car seat itself that attach to special metal anchor points in a vehicle. Surprisingly, LATCH was supposed to make car seat installation simpler for parents so they didn’t have to struggle with seat belt installation. Yet, many people still find the system confusing. LATCH isn’t necessarily safer than seat belt installation, but it depends on your car, placement of the seatbelts and anchors, type of car seat, etc. But it can get confusing if you don’t know when and how to use the straps and anchors. And like we’ve said before, if you don’t install a car seat properly, it will not protect your child the way it should. First are the lower anchors. They’re the metal u-shaped rings that are down in the vehicle’s back seat crack. You should be able to reach in and feel/see them. In some newer cars, they’re a lot more visible. There also may be stickers on your seats (child in a car seat symbol) indicating where these are & which seats have them. Some cars only have them on the side seats and NOT the middle seat. Then you have the tether anchors. These are metal anchors (a ring or bar) that can be found in various places behind the back seat. Cars made since 2001 will have at least 3 of these in the vehicle. They’re designated with a ship’s anchor symbol so you can tell them apart from cargo hooks. Cargo floor in SUVs, vans, hatchbacks, etc. Expert tip: Don’t get the tether anchors mixed up with cargo hooks if you have an SUV, van, or hatchback. If in any doubt, check your vehicle owner’s manual so you know what’s what. And again, look for that ship anchor symbol. The first are lower anchor straps. These are meant to hook to the vehicle’s lower anchors (the ones in the seat crack). They will have a connector on one end. The connector will either be a push-on connector or a hook and loop style. We’ve found car seats with push-on connectors are much easier to install. Most car seats have two separate lower anchor straps. Some booster seats have one rigid lower anchor connector instead. For rear-facing, most seats use only the lower anchors. Only a very few can use the top tether along with the lower anchors. However, forward-facing seats must use BOTH the lower anchors and top tether. The tether strap comes on all forward-facing & convertible car seats. It comes out from the top of the car seat and has a hook on one end to attach to the vehicle’s tether anchors. Seat belt or LATCH – which should you use? This is where a lot of parents get confused. For the majority of car seats, rear and forward-facing, you will use EITHER the seat belt or the LATCH system to install the seat. You don’t use both at the same time unless the car seat is specifically designed for that. Right now, only a couple of models exist that allow you to use both. Using both seat belt and LATCH in any other car seat can make it more dangerous. Do you have a vehicle that’s older than 2001? If so, you may not have a LATCH system at all. Do you have more than one child or need to switch out car seats often? A seat belt installation may be easier in that situation. Does your car have lower LATCH anchors that are easy to access? These make LATCH installation easier. Does your car seat have push-on LATCH connectors? These also make LATCH installation easier. How much does your child weigh? In most car seats, LATCH can only be used up to a certain weight limit, such as 40 – 65 pounds. Then you must stop using it and use only a seat belt installation. As soon as you install a forward-facing car seat with a harness (or convert your rear-facing to forward), you must use a top tether. Top tethers are meant to secure forward-facing seats to keep them from tipping forward in the event of a crash. Without the tether attached, a seat can be thrown 4 – 6 inches forward. It may not sound like a lot, but that movement can allow a child’s head to collide with the back of the front seat or the console, resulting in serious head trauma. Top tethers can be used with either a seat belt installation or a LATCH installation. The point is, they must be used on a forward-facing harnessed seat. If your older vehicle doesn’t have tether anchors, you may be able to get them retrofitted with aftermarket hardware. Some car manufacturers like Toyota have retrofit programs for pre-2001 cars. It may cost a nominal fee, but check with your car manufacturer first to see if they can help. If they can’t help, take your car to a CPST (child passenger safety technician) to see what they can recommend. They may be able to help you find 3rd party hardware and a professional to install it. Tether anchors in any vehicle manufactured after 2003 should be marked with a ship anchor symbol. However, the best way to make sure you’re using your car seat tether correctly is to read the car seat manual AND your car owner’s manual. Highlight that important info or place sticky notes in the manual so you can easily flip to it when you need to install a car seat. When in doubt that you’re using LATCH correctly…. Consult your car seat and vehicle manuals. Look for tutorials on YouTube or the manufacturer websites. Visit a licensed CPST (child passenger safety technician). If your tether strap is too short to reach an anchor in the ceiling of your vehicle, call your car seat manufacturer and see if they have an extension. Best yet, do some research and figure out which car seats have tethers that will work with your specific vehicle’s tether anchors. 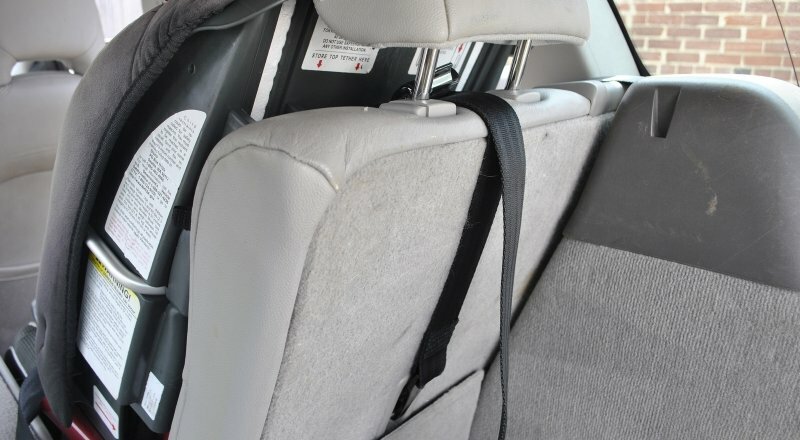 If you have multiple children and a position in the back seat with no tether, try to arrange it so that a rear-facing child or child in a booster seat takes that spot instead so the forward-facing child can use the tether. Do not attach the lower anchor straps or top tether straps of two car seats to one anchor. Also, ONLY use the direct corresponding tether anchor for that particular seating position (right behind or just over that seat). 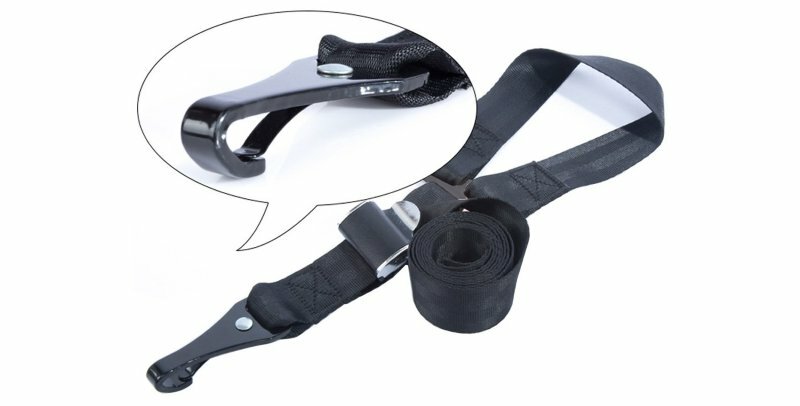 Having trouble getting the top tether strap tight? Try pulling the strap tight at different angles. Also, some car seat tether hardware is more compatible with some vehicles than others. That’s why research is super important. Try calling the manufacturer to see if they know whether your car is compatible. What about booster seats and LATCH? Seat-belt positioning booster seats don’t have a weight limit when it comes to using LATCH, unlike harnessed seats. However, only some booster seats have LATCH capabilities. One of them is the Clek Oobr, which we reviewed recently. For a booster seat, LATCH mostly serves to provide seat stability and to keep it in place when no one’s riding in it. Remember, the LATCH system consists of lower anchors and top tethers. Your vehicle will have LATCH anchors, while your car seat has the straps that attach to them. You should only use EITHER the seat belt or LATCH to install your harnessed car seat. The top tether should always be used for a forward-facing, harnessed car seat, but doesn’t need to be used for most rear-facing and booster seats. When in doubt that you’ve installed LATCH correctly, the first place to look is in your car seat and vehicle manuals. You may also call the manufacturers, watch video tutorials, or visit a licensed CPST (child passenger safety technician).